NEW YORK, August 28, 2018 -- Pitchfix USA, the world leader in divot tool golf accessories, has partnered with Folds of Honor to produce sleek and durable golf tools to benefit the organization's fundraising efforts. Pitchfix will donate a percentage of all Folds of Honor (FOH) branded sales to help fund educational scholarships to the children and spouses of fallen and disabled service members. 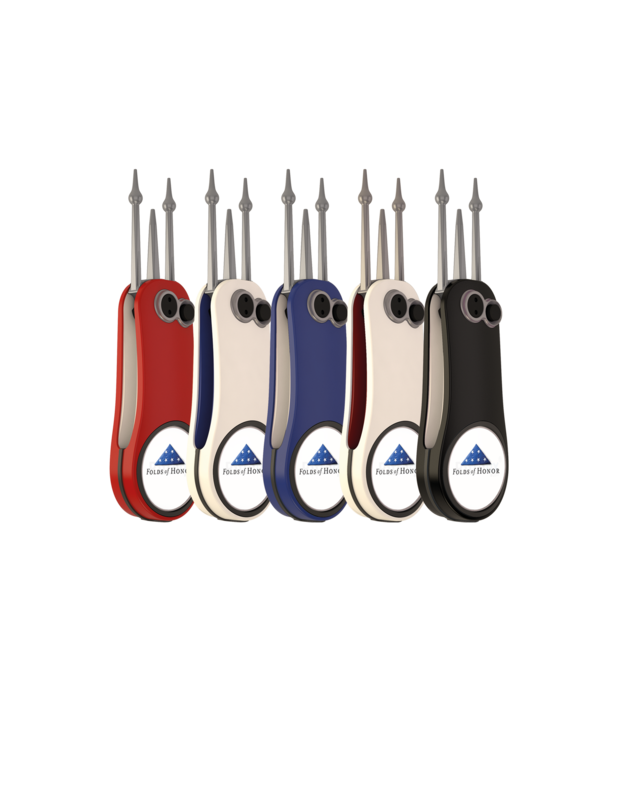 The newly released Pitchfix tools come in three model choices and several color options, including red, white or blue. Each tool sports the white stars and the blue Folds of Honor logo to demonstrate appreciation for the honorable and faithful service of our military members. There is a model and packaging option that enables event sponsors to place their brand on the product alongside The Folds of Honor image. The product is a great choice for Memorial Day, Independence Day, Veterans Day, or any other occasion. Information about Pitchfix Folds of Honor items, including exclusive pricing for Patriots Day events and tournaments, can be found at http://foldsofhonor.mrpromo.com/. "It's a privilege to partner with Folds of Honor and to support an outstanding organization that does so much for so many deserving American patriots," said Bart Fokke, Pitchfix CEO. "We look forward to changing lives by making a significant contribution to the families of fallen and disabled service members." "We are excited to align with an outstanding company like Pitchfix that takes pride in its high standards and quality," said Major Dan Rooney, CEO/Founder of Folds of Honor. "We thank them for supporting Folds of Honor and encourage all golf outings to purchase these premium quality divot tools for their events. " Founded in 2005, Pitchfix is the market leader for switchblade divot tools and other golf green related products in Europe and Asia and is renowned for its high standards in design and product quality. It aims to be the market leader in divot tools and other golf related products in the United States by designing, manufacturing and distributing an ever-growing line of high quality and innovative European designed products through selected distribution partners. Pitchfix currently offers an array of diverse and innovative products for golfers worldwide and has operational and manufacturing facilities in Hong Kong, China, the Netherlands and the U.S. The company operates three fulfillment centers in the United States to facilitate custom order processing. For further information go to www.pitchfixusa.com.